Named on Thursday as the nominee of the major opposition parties for the July 17 presidential election, Meira Kumar is a senior Congress and Dalit leader with long and varied political experience and a strong proponent of social justice and social equity.Soft-Spoken, Meira Kumar, 72, is the first woman Speaker of the Lok Sabha, a former Union Minister and has held senior organisational responsibilities in the Congress, including as General Secretary. 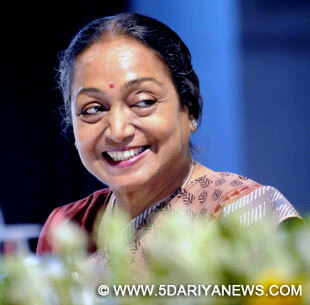 Daughter of freedom fighter and former Deputy Prime Minister Jagjivan Ram, Meira Kumar was born on March 31, 1945. She studied law and pursued her Master's after graduating in arts. Meira Kumar joined the Indian Foreign Service in 1973 but resigned after being asked by former Prime Minister Rajiv Gandhi to contest the Lok Sabha by-election from Bijnor in Uttar Pradesh.She has been elected to the Lok Sabha five times and from three different constituencies -- Bijnor in Uttar Pradesh, Karol Bagh in Delhi, and Sasaram in Bihar.Belonging to the Dalit community, she sought to change the mindset against private sector reservation as the Union Minister for Social Justice and Empowerment between 2004 and 2009. Meira Kumar favours deepening social justice rather than providing patronage to the weaker sections and has been unhappy about caste being "a dominant factor" in Indian society. In her speeches, Kumar has said that the country's sustainable growth was not possible without ending centuries-old exclusion of marginalised groups such as Scheduled Castes and Tribes.She was Congress General Secretary from 1991-92 and 1996-99. She has been a member of the Congress Working Committee (CWC), the highest decision-making body of the party. Kumar was elected Speaker of the Lok Sabha in June 2009 and constantly emphasised on productive use of time by the members. She headed several parliamentary delegations, including to the Inter Parliamentary Union and Commonwealth Speakers Conference. With her father a member of the Interim Government in 1946 and also of the Jawaharlal Nehru cabinet, Kumar as a child had on many occasions met India's first Prime Minister and was "fascinated by his ability to effortlessly connect with the children". Her interests include writing poems in Hindi, shooting, and preservation of cultural heritage and Indian craft.